Stones Throw was written by Jennifer Stone. Stones Throw was published by North Atlantic Books, Frog Ltd. Subjects of Stones Throw include American - General, American Essays, Essays, Literary Criticism, and Literature - Classics / Criticism. About Jennifer Stone (Author) : Jennifer Stone is a published author. 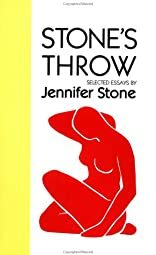 A published credit of Jennifer Stone is Stone's Throw: Selected Essays.